One of the biggest things that many people facing divorce encounter is a feeling of isolation and loneliness. The person who was likely their primary life companion is now gone. While you cannot replace that person in their life, you can offer to help alleviate some of their loneliness. Make contact with your friend and offer to spend time with them. For example, some people just want a friendly chat online, while others would love to go out for a carefree night where they can forget their troubles. On the other hand, remember that sometimes, the person just needs to be alone, too. It is very kind to offer help, but sometimes the person who is going through the divorce doesn’t even know what they need. Take a look at your resources, and consider what you have to offer. For example, if you can help them out with a little bit of cash, do so. If they have lost their car and you can offer a lift to work, ask them if they would be willing to accept that kind of help. If they are having a tough time dealing with their children, offer to babysit for a weekend so that they can get their head together. Offering your friend a concrete task that you can fulfill is a great way to get them back on their feet. 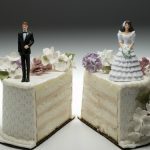 A divorce is a thing that brings up many harsh feelings, and no one is immune to feeling petty and cruel. There may be times when your friend turns downright venomous. It may shock you to see that someone you like so much is so mean, but remember that they are acting out of a place of hurt. Remind them that they should not vent where their children can hear them, and instead, take them to a safe place where they can rant as they like. After some ranting, you can start inserting some advice, but let them get their anger out. After a divorce, many people go through a period of withdrawal. This is normal, and even healthy. They are gathering their strength and recovering. However, the problem is that too much isolation is bad in the long run. They may become withdrawn and bitter, and if you are their friend, you of course want to keep this from happening. Invite them out for food or for fun activities, like camping or sporting events. Anything that gets them engaged with the outside world again is a good thing. While you should of course be aware of your own limits and while you should avoid extending yourself further than you should, make sure that you are consistent with your offers of help. Some people help out a great deal at the beginning, but as time goes on, their efforts flag and they lose touch. Healing from a divorce is a long process, and your friend may go through it quickly or slowly. This is something that must be handled at your friend’s pace, so stay with them, and go the distance! At the end of the day, simply remember that your friend will not always be this upset or this angry. Divorce is a very rough thing, but the people who grow from it and learn from it come out stronger. Be there for your friend, and remind them that you are there. This may be all it takes for your friend to come around.